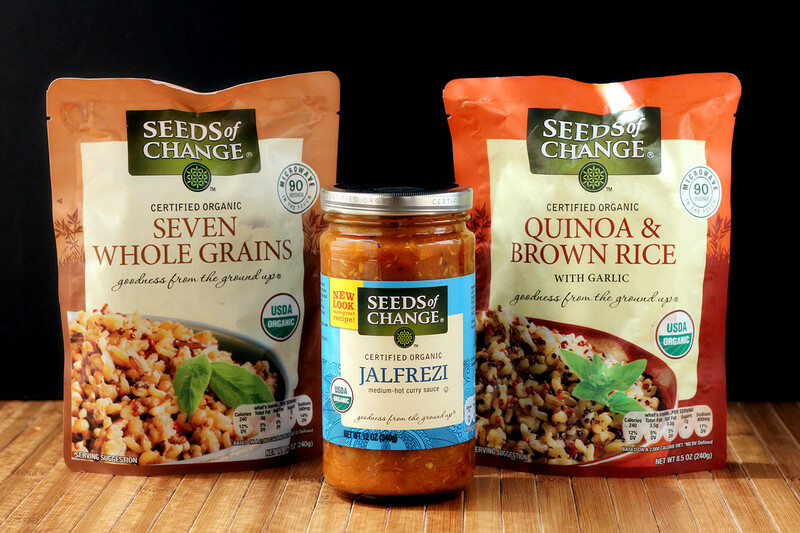 I got a chance to sample several products from a company called Seeds of Change - two types of grain products in pouches, and Jalfrezi sauce. The Jalfrezi is supposed to be a medium-hot curry sauce, It had a little spice, but I wouldn't call it hot. But that's okay. You can always add more heat if you want, but you can't take it away. The curry flavor wasn't an in-your-face sort of thing, so people who are wary of strongly-flavored Indian curries or super-hot Thai curries might like this one a lot. I don't dislike those other curries, but I have to say that I was really smitten with this sauce. It's got great flavor, it's different from the usual suspects in my kitchen, and it makes dinner really simple. So far, I've used it for cooking chicken thighs in my slow cooker and for braising some pork shoulder. 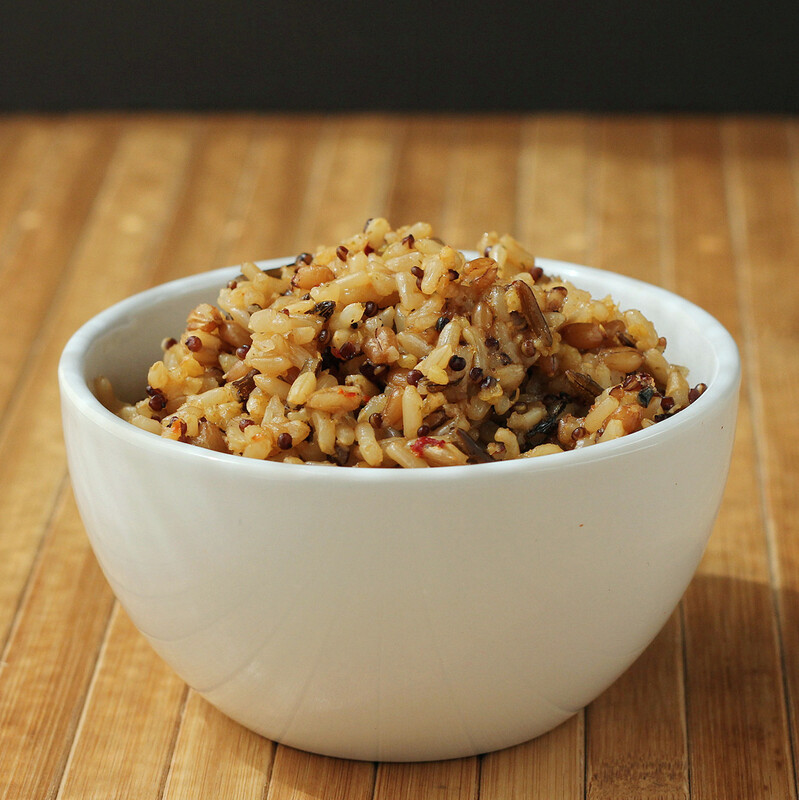 Those grain packages are precooked, so you just need to heat them, either in a pan or in the microwave. If you're microwaving, you just tear a corner of the bag and heat right in the bag - great if you're taking this to work. So far, I've only tried the Seven Whole Grain, and it was really flavorful as-is. I ate a small bowl of it for lunch one day, and I added some tomato chunks and feta cheese and ate it as cold salad later. Who's it for: Folks in a hurry who want food that's good for them. Pros: Easy. Really easy. And I love the Jalfrezi sauce. Cons: Let's face it. Cooking from scratch is always going to be less expensive. Wishes: So far, none. I'll be looking for other sauces to try. Vacu Vin is probably best known for their vacuum tools for wine that remove the oxygen to keep wine fresh. But that's not all they make. Much of it is barware related, like the cute little multi-jigger that's taken up permanent residence near the rum and vodka portion of my life. First, let me be honest. I have a weird fetish for measuring tools. I have two scales, more measuring cups than should be legal, and a whole lot of measuring spoons. But that doesn't stop me from ogling even more measuring tools. Funny thing is that except for a couple of shotglasses with no measurements at all, I didn't have any sort of dedicated cocktail measuring tools. So I was more than happy to take the Vacu Vin Multi Jigger for a test pour or two. 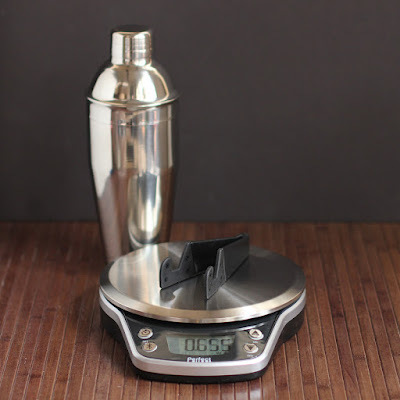 With jiggers, you really don't need a lot of measurements, and generally you're measuring by ounce. This measures 1 1/2, 1 1/2, and 1/4-ounces and also shows the measurements in mililiters. But no tablespoons or teaspoons to get in the way of proper drink mixing. To measure, you tilt the glass in different ways to get the three larger measurements. The bottom side of the glass measures 1/4 ounce. Yes, it's a little gimmicky, but it's also fun. And once you remember which angle is which measurement, you don't need to look to see the lines at all. Who's it for: People who like fun, unique, yet useful bar tools. Pros: It works. It's different. Relatively unbreakable. Cons: Because it's different, it might befuddle guests at your bar until they use it. Wishes: Measuring lines in color, maybe? Just for the fun of it. Numi teas; Cosy mug courtesy of Duralex. I've been enamored with Numi teas since they came up with the idea of the "blooming flower" teas that expand in the hot water to form a beautiful presentation. Their newest offering is about as far from those blooming teas as you can imagine. The single-serve Realcups are designed to work in a Keurig coffee maker. But, unlike the cups that are filling up landfills, these are recyclable. So you can have easy tea and not feel so guilt-ridden. I like tea a lot, but I'm prone to leaving a teabag (or loose tea in a holder) in the water for too long. It's just too easy to get distracted and walk away from it and forget about it. 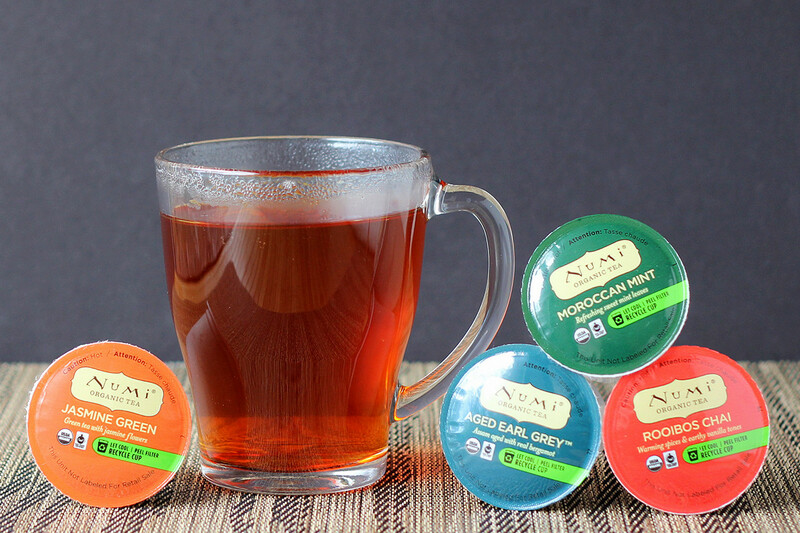 With the Numi Realcup , it's just brew, and drink. I was given all four flavors to sample - Aged Earl Grey, Jasmine Green Tea, Moroccan Mint, and Rooibos Chai. Of the four, the Moroccan Mint was my favorite, but that's simply because I love mint tea. It's a perfect warming drink on a chilly evening. I liked the Earl Grey more than I expected. Not that I dislike it, but it wouldn't be my first choice. This one, though, is a nice morning tea. The Rooibos Chai had the spicy chai flavors, but it wasn't overwhelmingly strong, so it would work well with food or by itself. The Jasmine Green was my least favorite, but only because one of them had to be last. Overall, I liked all of them, and I liked the convenience of being able to just pop one into the machine and have the tea brewed correctly. Oh, and Numi teas are organic, if that's important to you. If you don't have a Keurig machine or don't like the cups, even if they're recyclable, Numi also sells loose tea, teabags, and those crazy flowering teas. And other stuff. Pros: Easy to use, recyclable. Cons: If you're intense about recycling, you'll want to tear the cup open and compost the tea, so that lessens the convenience factor a bit. Wishes: More flavors!!! More! More! The J.K. Adams Trilogy Collection might sound like the latest sci-fi series, but it's actually a very cool set of cutting boards. Okay, let me admit this. I have a lot of cutting boards. But ... I use them. Some I use for cutting, some are more often used for photos. I'm not big into set dressing, so when I take photos I like to have different surfaces for the dishes - or the food - to sit on. These aren't huge boards that you're going to use for carving a turkey - or even a chicken. The largest of the three boards is 9 3/4 x 8 3/4 inches, so they're best suited for bar boards, for cutting small garnishes or small amounts of ... whatever .... or for serving. I could see setting out one with cheeses, one with meats, and one with other small noshes. Or use them for display. Right now, mine are on my kitchen counter, looking decorative. 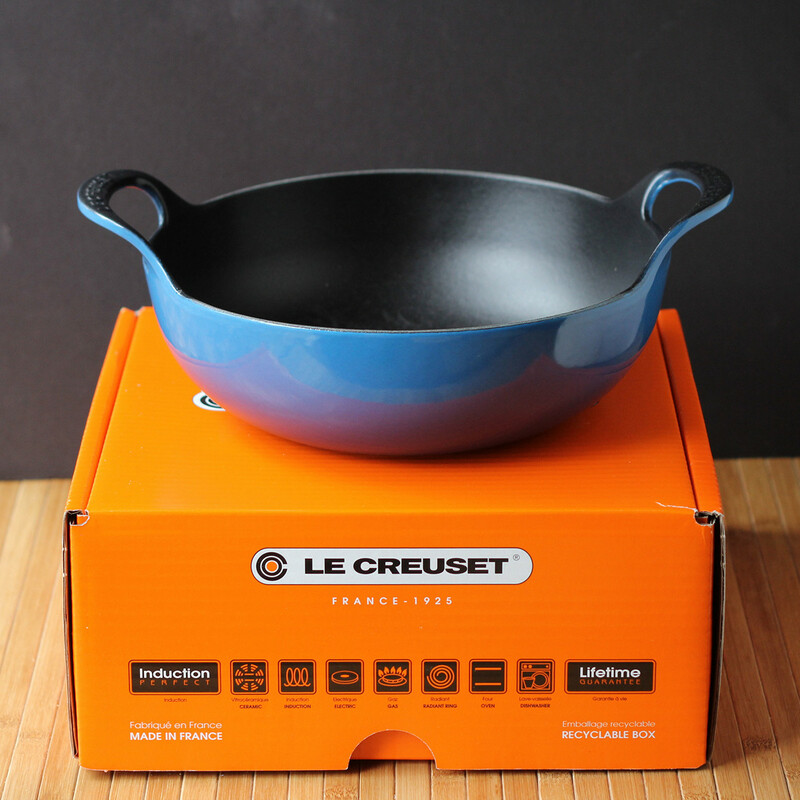 They'd also look good in the midst of some cookbooks that you keep in the kitchen. Heck, even my friends who don't like lots of stuff on their kitchen counters might make an exception for these. And, this is totally silly, but I even loved the tag that came with the boards. They're secured with a fat rubber band, with a tag that looks like a library card. That'll probably end up being used as a bookmark in one of my real cookbooks. 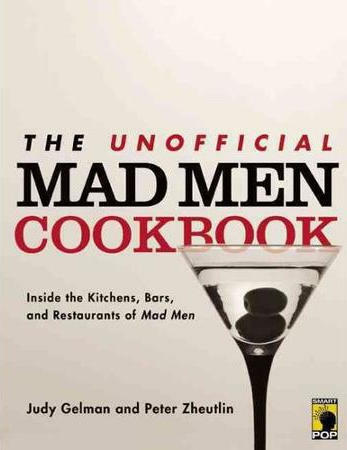 If you're looking for a gift for a cook who likes to read, check these out. Who's it for: Cooks who read, or readers who cook. Pros: Decorative. Nice wood. Great for small tasks. 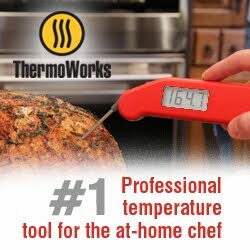 Cons: Your turkey ain't gonna fit. Wishes: I hope they come out with an encyclopedia set with a larger cutting board (maybe fish, vegetable and meat books!) and a dictionary chopping block. Earth Day is coming on April 22, and I've scored a little giveaway for you. 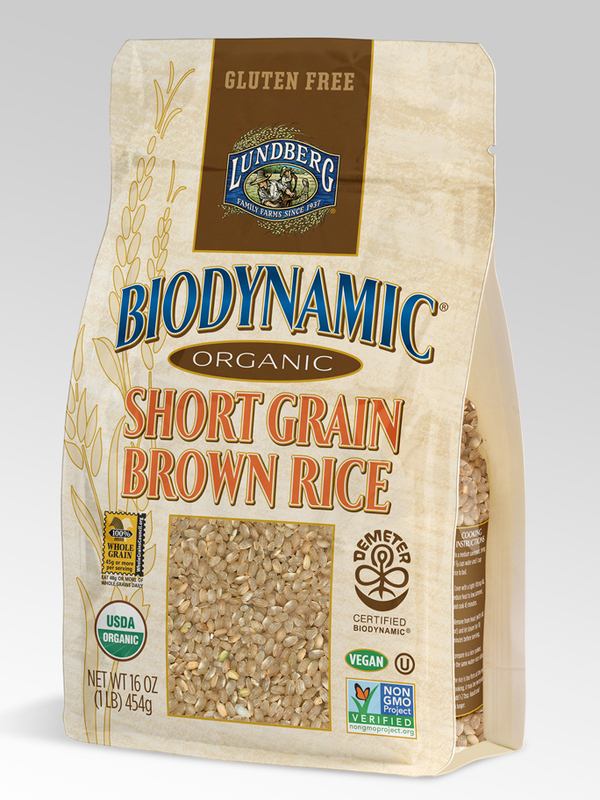 Lundberg Family Farms (you might think of them as that company that sells a lot of rice) is particularly proud of their use of biodynamic farming, which is "a holistic approach that aims to create a self-sustaining ecosystem within the farm." They're offering one of my fans a bag of Biodynamic Organic Short Grain Brown Rice along with a $30 gift card from Whole Foods ... so you can add something else to that rice. To help explain biodynamic farming, Lundberg Family Farms, Whole Foods and Demeter are hosting a Twitter party at 3:30 p.m., est on Earth Day (April 22). Look for them and for the hashtag #LFFEarthDay to join in the conversation. If you're not familiar with them, Demeter USA certifies biodynamic farms and products, so they'll have all the answers you need. Besides my giveway here, you can visit Lundberg Farms on Facebook and enter their Meet the Lundbergs photo contest for a chance to win more prizes and to learn something new about the Lundberg family. Lundberg Farms sponsored this post and is providing product for the giveaway. Your mom called. She wants fudge for Mother's Day. And if it's got a little hint of hootch, she's okay with that, too. I recently got a chance to sample the 1-pound box of Fine Spirits Fudge from The Mill Fudge Factory, and I've got some for you, too. Before I got the offer, I didn't know anything about the company, but I figured fudge can't be bad, so I said yes first and researched later. The company is more impressive than I expected. They were highly rated by the Cooking with Paula Deen magazine, and the fudge is made from scratch in small batches in New Hampshire. And the 1-pound batch of fudge came in a nice box tied with a ribbon. Nice for gift-giving. 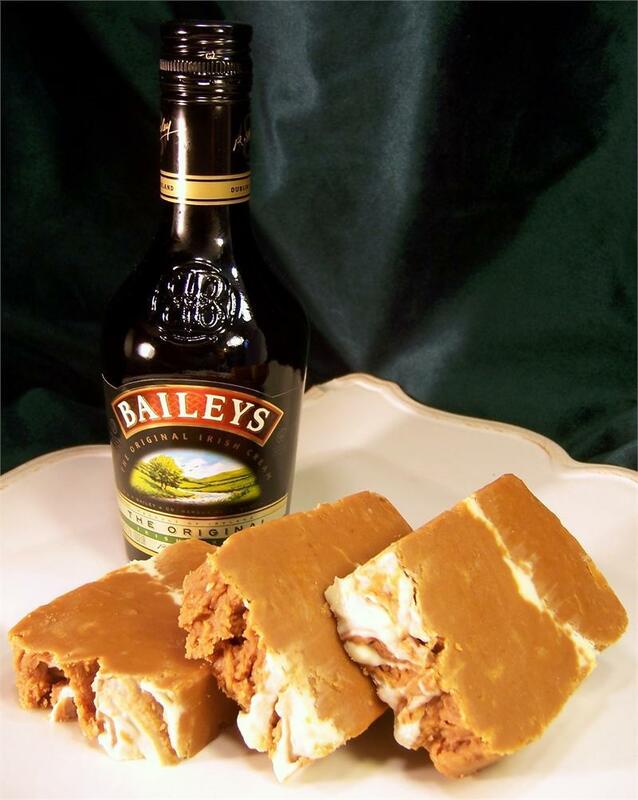 This Baileys fudge is one of "Fine Spirits" fudges. They have a number of different types of fudge, but the one I got had spirits (are they friendly spririts?) in three of the four types of fudge - and this is the same collection you'll be getting, if you win. The flavors in the Fine Spirits box are: Scottish whisky, Little bit O' Heaven (with Baileys Irish cream), Cabin Fever (with maple whisky), and Belgian chocolate. I wouldn't refuse any of them. They're all very different from each other, with flavors added by the whiskies they're infused with - but they're not going to give you a blast of alcohol or even a little whiff - all you get is the flavor without the buzz, so if the kids sneak into mom's fudge, it's not going to be a problem. Well, not a problem for the kids. Mom might have a different idea. The fudge is smooth, with just a little bit of texture. The company makes a Scottish-style fudge, so it's not as silky as some commercial types of fudge. But it's not grainy either. The fudge is best when it's fresh, or you can freeze it for longer storage. For the giveaway, the company is asking that you sign up for their newsletter, which also automatically gives you a 10% coupon for everything on their site, so you can buy lots and lots of fudge for mom, and you, and daughter, and you, and daughter-in-law, and you, and grandma, and you, and granddaughter, and you ... or something like that. If you want to sign up for the newsletter and get you coupon, and you don't want to enter the giveaway, you can sign up for the giveaway here: http://themillfudgefactory.com/e-news. If you're entering the contest, there will be a code phrase you'll get after you sign up. You'll need that to verify that you've subscribed for the contest entry. When I was a kid, ice cube trays were pretty basic, and they were pretty good for making cracked ice. No neat cubes, no uniform pieces. The ice cubes from restaurants were so much more ... interesting. Because they had fancy machines that molded the ice. Now, you can mold your ice cubes into all sorts of fun shapes. Like balls. I tested an Ice Ball Tray that makes four 2-inch balls in one tray. It's fairly simple - just fill the bottom tray with water (it's suggested that you use distilled water for clearer ice cubes, but I'm not that fussy) then put the top part on and press down. When water started coming out of the overflow holes on top of the mold, I put my fingers on the holes, kept pressing down, and the overflow went out the sides. Probably not necessary, but it kept water from filling the top of the mold, which made it easier to get the ice balls out later. Or, you could put the tray together and pour water into the holes. Either way works. I have to say that not every ball is perfect. If there's a little too much water, it can create a nub at the overflow hole like the one at the top right in the photo. If the two halves of the mold aren't snugged up to each other, you might end up with a ring of ice around the cubes. But neither of those things are a big deal. Those smaller, thinner bits will be the first to melt when the balls are in a drink, so people will probably never notice that the balls aren't perfect. They'll just think that you made round ice balls. Or, if you really need to have perfect rounds, you can run some cool water over the protruding excess pieces to melt them away. These aren't the biggest ice balls I've seen, but they're a decent size and the mold is easy to use. And you could use it for other things as well, like making round balls of Jello. Why you'd want to do that, I don't know. But you certainly could. Next time I bake a cake, I'm going to try baking a few ball-shaped cakes as well. It's probably going to be tricky because I'll have to account for the rising cake, and I have a feeling that there will be excess cake around the perimeter of the balls - but even half-rounds or Saturn-shaped cakes could be fun. If it works out, there will probably be a post about it on Cookistry. Meanwhile, I'm just making plain old ice. With plain water, which makes cloudy ice. And I'm okay with that. Who's it for: People who want to make quirky ice. Pros: Not expensive. These are some of the most affordable on Amazon. Cons: Makes 2-inch balls, so if you're looking for the huge ones, this isn't them. On the other hand, it's a reasonable size that will fit pretty much every glass you have. Wishes: It would be great to get a 3-pack with different sized molds. Wine chiller in a clear bottle. 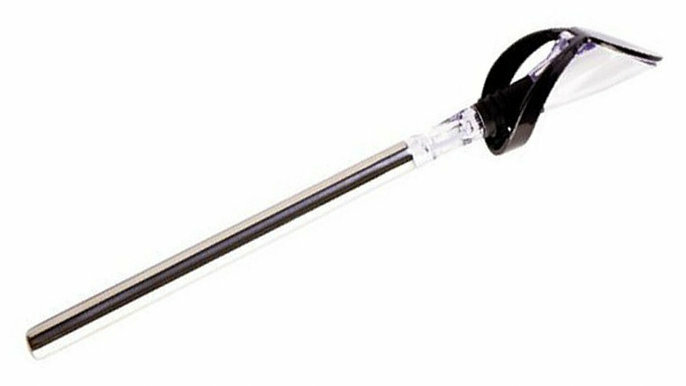 I've been fascinated by these wine chiller things that are a metal rod that you keep in your freezer, and then you insert the rod into your wine bottle and it chills the wine. I like cool or cold wine, but I don't always have a bottle in the refrigerator. That would require me to plan ahead, and sometimes I don't think about how great a glass of wine would be until I'm actually thinking about drinking it. And then I've got a warm bottle of wine and an empty wine glass. So, when I got a chance to review the Wine Chiller with Stopper from Kitchen Ezentials, I figured it would be fun. I shoved the wine chiller in the freezer - the instructions say that two hours is sufficient. It's not really big, so in theory it doesn't need a lot of time to freeze. Really, though, it makes sense to toss it back into the freezer after you use it each time so it's always ready. 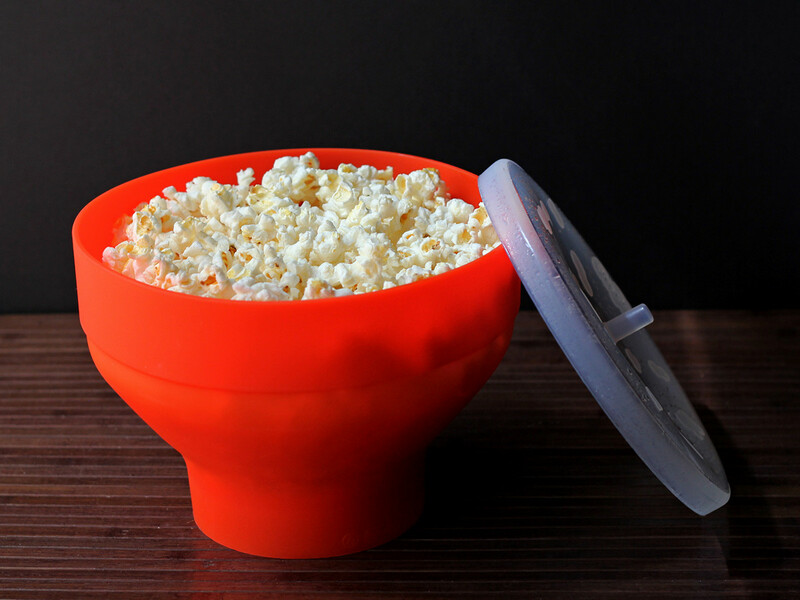 It doesn't take a lot of space, so you can easily store it in the freezer all the time. The idea is that you pour out just a little bit of wine to make room for the chiller, then insert it into the bottle, and your wine will be cooled really quickly. I noticed a temperature difference but afterwards I realized I should have actually measured the temperature. Oops. More wine needed. So I tried again a few days later. The wine that I poured out was at 68 degrees, which was room temperature. I inserted the chiller and let it sit for a few minutes while I sipped my 68-degree wine. When I poured the next little bit, it was 63 degrees. When that was consumed, the wine was down to 62 degrees - so a total drop of 6 degrees in just a few minutes. The instructions on the box say you can drink immediately, but on Amazon it says you should wait 5 minutes, so I tried one more test. This time I started with 70-degree water in a bottle and let the frozen chiller hang around in the bottle for 5 minutes before pouring. The water was down to 64 degrees, so it was again a drop of 6 degrees from the starting point. 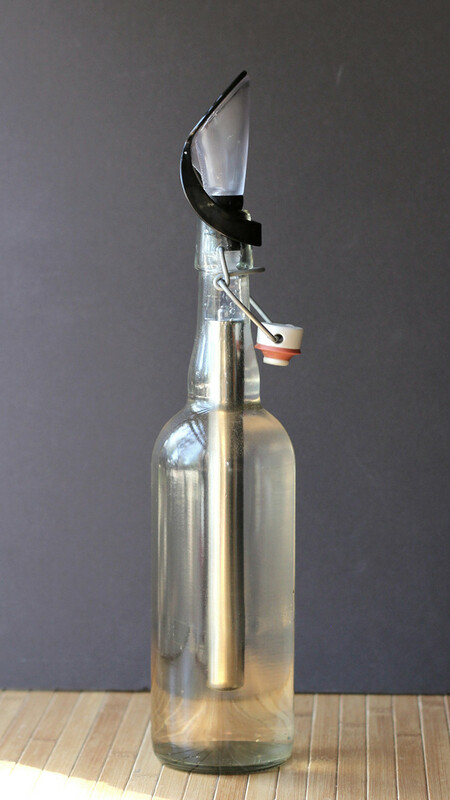 Side note: Do NOT use the wine chiller in a narrow-necked bottle like the one you see in the photo above. The chiller slid in just fine, but I had a heckuva time getting it out - I all but destroyed it in the process. The only thing I can figure is that there was enough shrinkage of materials that it slid in willingly, but once it warmed up a bit, it was just a hair tighter. Oops. I have to say that the wine definitely went from warm to nicely cool and more drinkable. The instructions note that it chills a red wine or it can keep a white wine at a properly-chilled temperature for an hour, which is nice - you can set the bottle on the table at dinner and you don't need to worry about the temperature during dinner. How cold it will ultimately get depends on what temperature the wine is when you start - and also on how cold your freezer is, but it seems like a six-degree drop was pretty consistent in my tests. Because of the way the chiller is constructed, the wine pours slowly and it's supposed to aerate the wine at the same time, so that's an added bonus. 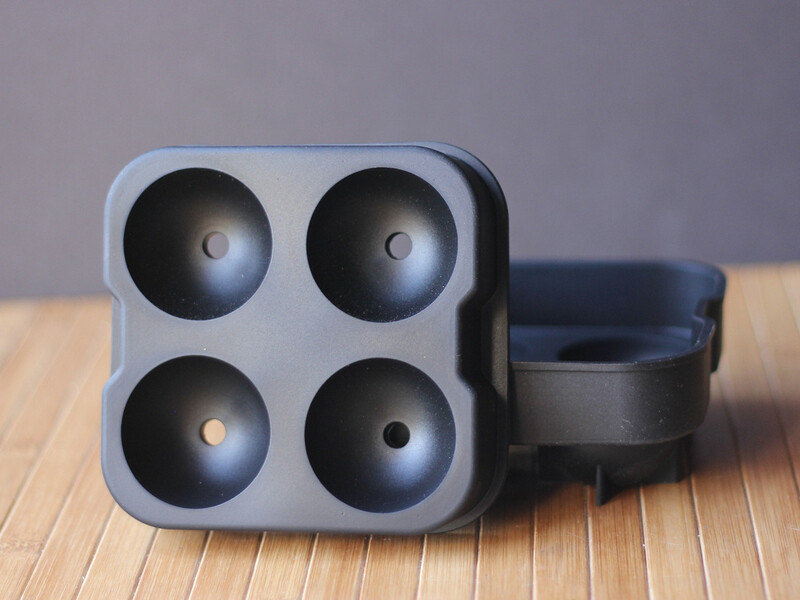 Who's it for: Scatterbrained wine drinkers who need a quick way to chill their wine. Pros: It includes a pourer, and won't take much space in the freezer. You could also use this to chill other beverages. Cons: The pouring spout is rather tall, so if you decide to put the wine in the refrigerator with the chiller in, you'll need to have a tall enough space. Wishes: It would be nice if there was a super-chiller model that would drop the temperature even more. I'm not sure if it's possible, though.